While Viktor Navorski was flying from his home country of Krakozhia to New York City, a military coup overthrew his country's government. Upon arriving in New York, he learns that his visa has been voided and his passport has been revoked. This means he can't enter New York nor can he return home. Because of this, he is forced to take up residence in the international terminal of the JFK airport for an indefinite amount of time. Steven Spielberg's "The Terminal" is inspired by true events in the loosest sense of the phrase. It is an entirely fictional story inspired by an actual person: an Iranian refugee named Mehran Karimi Nasseri, who was stuck living in the Charles de Gaulle airport in Paris for about 16 years. This story is not about Mehran Karimi Nasseri, but a fictional man named Viktor Navorski, played by Tom Hanks, who comes from the fictional country of Krakozhia. While traveling from Krakozhia to New York, a coup happens in his country, causing his passport and visa to be revoked. This means he is unable to get into New York and he also can't go home to Krakozhia. 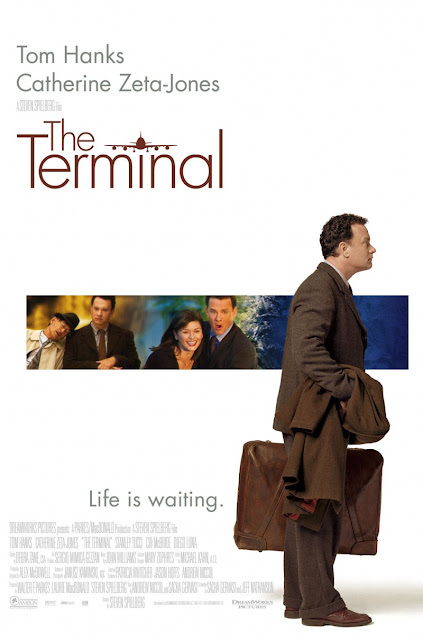 Now, Viktor is forced to live in the international terminal of the airport until the war is over and America recognizes his country's new government. For the most part, "The Terminal" is an easily digestible, sometimes interesting, crowd-pleasing movie that can be both charming and fun. Tom Hanks is as likable as ever even with his nondescript eastern European accent. We can't call his accent inaccurate since Krakozhia doesn't actually exist. An accurate Krakozhian accent could have sounded like Nien Nunb from "Return of the Jedi" for all we know. There are many moments of humor that come from Viktor's forced fish out of water scenario as he teaches himself English, keeps himself fed, and eventually, somehow, finds employment in the airport. There are a couple of romantic storylines thrown in as well, the first being between Zoe Saldana's Delores Torres and Diego Luna's Enrique Cruz. The second romance is between Viktor and a flight attendant named Amelia Warren, played by Catherine Zeta-Jones, who travels to and from the JFK airport often. These love stories are the weakest parts of the narrative. They are overly schmaltzy and syrupy sweet, a Spielbergian signature style, which may put some viewers off because they feel so totally out of the realm of possibility. Also, though we adore Stanley Tucci, his character Frank Dixon seems a little too vindictive at times. It's obvious he acts the way he does just so the story can have a villain beyond the bureaucracy of American red tape. Another downfall of this film is its pacing. It can be a bit slow at times and the story starts to drag towards the middle of the second act. Overall, "The Terminal" is a simple but enjoyable feel-good movie that we think is worth checking out despite its faults. It may not be Steven Spielberg's best movie, but it's certainly not his worst.